Hello to my readers. I have started getting my plans for conferences in 2019 together and I am happy to announce that I will be presenting this coming year at the North American Collaboration Summit in Branson, MO. 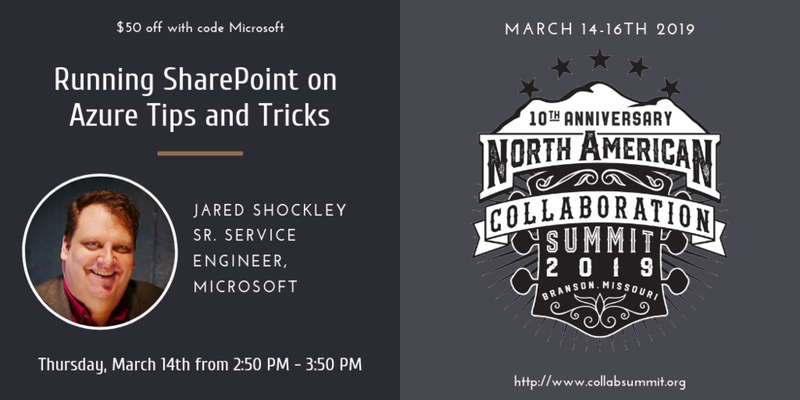 I have heard a lot about this conference from many of my SharePoint Speaker friends and I knew I needed to get it on my schedule. Now, many of you might say "Why Branson, Missouri?" This conference started as SharePointalooza and has grown to the event we now know. I have heard a lot of good things about the creator and coordinator, Mark Rackley. Now, if you want to get all sorts of information on how to use SharePoint on Azure, come attend my session Running SharePoint on Azure – Tips and Tricks. I will go over the basics of hosting SharePoint on Azure and covering specific scenarios. I encourage you to join myself and tons of great speakers on SharePoint and Office 365 in Branson.